Multi-modality bladder preservation with maximal transurethral resection of the bladder tumor (TURBT) followed by definitive chemoradiation is becoming increasingly popular and an attractive option to radical cystectomy for treatment of muscle invasive bladder cancer. Ideal candidates are patients with unifocal, T2 disease undergoing maximal TURBT with no gross residual, patients with tumors <5 cm, and patients with good bladder function. 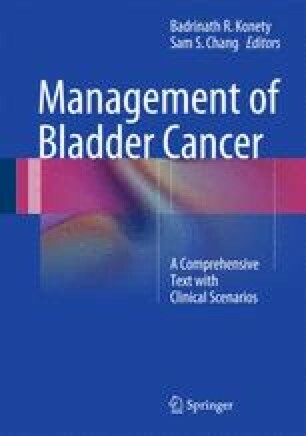 Bladder preservation treatment is well-tolerated, offers similar survival outcomes to radical cystectomy (5y OS 40–60 %), and approximately two-thirds of patients are cured 5 years after treatment. Studies have demonstrated that the majority of patients undergoing bladder preservation are satisfied with their quality of life with minimal urinary distress.